The snow day continues so a chance to do some craft albeit all for Senior Section Lone fun. First to be done is the penguin for Lones. This was a kit from Crafty Little Bugs so it was easy and quick to do. From bits to penguin in about five minutes. Second on the list was the Lone Christmas tree decoration swap. I bought some wooden decorations from Tesco. Then I carefully traced around the decoration onto the left over Centenary wrapping paper. Then cut it out – one for each side. Finally I added a Centenary sticker to the decoration. So now each of the girls will get a wee centenary reminder for their tree. I think that’s a nice reminder of a wonderful year. For a Senior Section craft I was making a charm bracelet using Shrink Plastic. I had some spare so I decided to make myself a pair of jigsaw earrings to wear at Capital Jig in October. I used 2mm link chain. I picture makes them look much darker than they really are – I used crayola metalic pens to colour in the jigsaw peices. 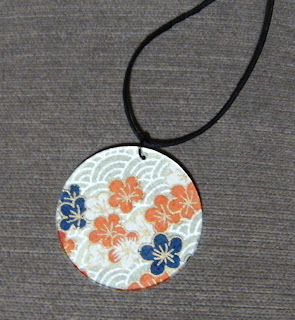 I made this necklace as a kit to go out in the Lones newsletter. It was so fast to do I thought I’d share. You’ll need: adhesive transfer sheet, acrylic pendant, jump ring and cord. Remove the protective plastic covers from the acrylic pendant. Get the adhesive sheet (Herma Transfer Adhesive Sheet) and remove the backing paper. Press the pendant onto the glue dots. Carefully re-lift the pendant – it is now evenly covered in glue dots (which are easily visible). Position the pendant over the paper image you wish to use and press down evenly. Carefully trim off excess paper (you might find using a craft knife makes this easier and neater). Pierce a hole carefully through the paper inline with the one in the pendant. Thread a jump ring through and close (you’ll need pliers for this bit). Thread a cord through the jump ring and wear. NB: To improve the life span of your pendant carefully apply clear nail varnish or PVA to the back of your picture. I did this for my Senior Section girls as part of the activities for the Mexican festival of Day of the Dead. 1. 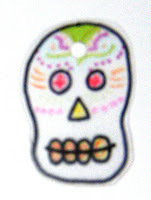 Draw your skull on the rough side of Shrink plastic using pens. This keyring used a 1/4 A4 sheet (the earrings an 1/8th). Beware the colour get darker once it shrinks. 2. Once your happy trim the skull (doesn’t have to be exact 3mm or less edging is fine). Punch a hole in the top for the keyring to go once it’s shrunk. 3. Place the skull in an electric oven (150ºC) on a flat baking tray, drawing side down and heat for 1-4 minutes until it goes flat. Allow to cool and add your keyring, earring or phone charm.